Chris Thompson’s locker sits directly across from that of Will Hill’s. A few seats down sits Austin Appleby and cutting up across the way is Earl Okine. To Thompson’s other side stands Josh Evans, gathering his things as Leon Orr passes by on his way to the door. This is the Orlando Apollo’s locker room, exuberant after an opening night win during the inaugural weekend of the new, experimental Alliance of American Football league; and it’s full of former Florida Gators. All in all there are eight former Gators on the roster. * Then there’s the coaching staff, led by Steve Spurrier and which includes Willie Jackson and Lito Sheppard…and David Reaves, the son of former quarterback John Reaves. And if still searching for connections, there’s the GM Tim Ruskell, whose son Jack [Ruskell] is a walk-on quarterback for Dan Mullen. The league, which is serving as an alliance with the National Football League and will broadcast on NFL Network at times while offering an out clause in each players contract if signed to a NFL team, aims to be a supplement to the NFL juggernaut, not a replacement. These former Gators—especially guys like Thompson, an undrafted free agent who’s league time was spent on practice teams and then Hill, a journeyman who’s dipped his toe in big moments from the NFL, the Canadian League and Arena Football—encapsulate everything the AAF is hoping to be; a first opportunity for some, a second chance for others, an avenue to continue the game that isn’t done with them yet. 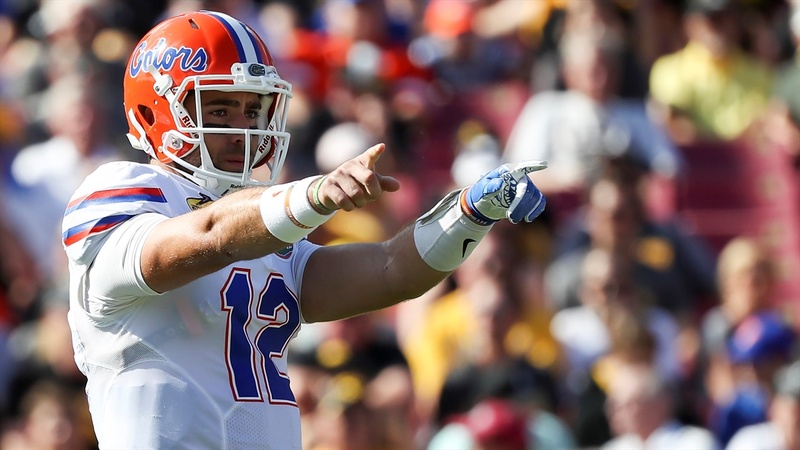 “Everybody’s journey has brought them to this point,” Appleby tells Inside the Gators. The places they’ve been at range; after being cut from the Washington Redskins in 2017, Josh Evans (3 tackles) went back to Jacksonville where he began his NFL career with the Jaguars and opened a gym. Earl Okine (5 tackles, 2 quarterback hurries, 1 sack) left Arizona after the Cardinals cut him in 2017 and came to Tampa where he’s been training in the interim, waiting for another shot. Thompson wasn’t too far away, working out with his brother after being let go from the Houston Texans last August. Hill (7 tackles, 1 pass breakup), the veteran of the group, was in a holding pattern. Then he heard about the AAF. “It’s been everything I thought it would be and more,” adds Appleby, who went in for the final minutes of Saturday night’s opener. Within that opportunity, there are things each of them knows needs to be addressed. Earl Okine says he needs to show teams he can slim down and play edge rusher. Chris Thompson feels he needed to bulk up, play stronger and show teams he can understand the little details. “Something’s missing for all of us, that’s why we’re not in the league, something we need to work on,” admits Appleby. That ultimate dream is the unapologetic goal and mission for each former Gator that’s strapping on the AAF helmet. “To get back to the NFL for sure, 100%,” laughs Okine. “It’s simple,” adds Evans, as Hill sticks his head in cackling “get that money” before high stepping off. He later seconded his goal, albeit with a more serious tone. There was a sense as Saturday’s game wore on that this could actually work, that quite possibly we could look back and say “I remember the first game.” After only one month together, there are the expected bumps, the understandable wrinkles that will need to be ironed out; but there was also an unfettered access that showed the AAF is aware a sport is great because of its fans and a palpable excitement exuding from the players who truly believe this is a golden opportunity. A lot of the probable success is based on an aspect that seems very much on purpose by a league that is pushing their regional teams. Because of those seven former Gators, all of them have played with half of the others at some point. “It’s been pretty good being able to get back with some of my former teammates, Earl and Will and them guys,” explains Evans. “It felt like we haven’t missed a beat since we played together in college so it was really a seamless transition,” echo’s Okine. Thompson says rekindling his connection with Appleby made it seem like they never left and as Appleby explains, it’s made this fast track training process much easier. “There’s something that we put in that’s a little bit new maybe, something that we put in, something that’s maybe a little bit new, something coach is drawing up in the dirt in the middle of practice, we can say ‘oh that’s just like this concept that we ran at Florida’ or we can speak the same language or just maybe little bit of a look or he knows my mannerisms or he knows that I’m gonna put the ball in a certain spot. As the opening weekend of the Alliance of American Football comes to a close and these former Gators head back to hotel where they’ll live together with their for the next two months, it’s Thompson who looks back at the Apollo’s first win and sums up best the mission of this league, this team, this group of guys and really, this game.